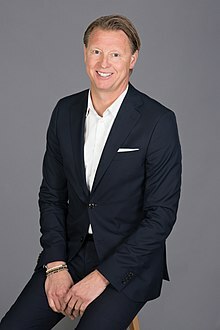 Hans Vestberg (born 23 June 1965) is a Swedish businessman and CEO of Verizon Communications, where he has worked as executive vice president of the company's Network and Technology team, and as chief technology officer. Vestberg was previously the CEO of telecommunications company Ericsson, president of the Swedish Olympic Committee, and is a former chairman of the Swedish Handball Federation. Hans Vestberg was born in Hudiksvall, Sweden, in 1965. He studied at Uppsala University in Uppsala, Sweden, where he received a degree in Business Administration and Economics in 1991. Vestberg began his professional career in Hudiksvall at Ericsson Cables in 1991. He worked at Ericsson for 25 years, with management roles for the company in Sweden, China, Brazil, Mexico and the United States. He was CFO for Ericsson in Brazil from 1998 to 2000. From 2000 to 2002, Vestberg was CFO for Ericsson in North America and controller for the Americas. He served as president for Ericsson in Mexico from 2002 to 2003. Afterward, he served as a senior vice president and executive vice president for Ericsson before he was named chief financial officer in 2007, a post he held through 2009. Vestberg became the first CEO of Ericsson without an engineering background when he replaced Carl-Henric Svanberg in January 2010. Ericsson ousted Vestberg on July 25, 2016, following poor financial results. Vestberg joined Verizon as the company's chief technology officer and executive vice president of its Network and Technology team on April 3, 2017. There, he oversaw Verizon's fiber network and the development of Verizon's nascent 5G network. Verizon announced on June 8, 2018, that Vestberg would succeed Lowell McAdam as the company's chief executive officer on August 1. Vestberg was the chairman of the Swedish Handball Federation from 2007 to 2016. He left the Swedish Handball Federation to serve as president of the Swedish Olympic Committee from 2016 to 2018 as the country vied to host the 2026 Winter Olympics to Stockholm and Åre. Vestberg had previously played semipro handball in Brazil. Vestberg is married and has two children. Vestberg is multilingual; he is fluent in Swedish, English, Spanish, and Portuguese. ^ Robins, Michael Sheetz, Anjali (2018-06-08). "Verizon picks Hans Vestberg as its next CEO, showing how the company is prioritizing 5G". CNBC. Retrieved 2018-06-08. ^ a b c d e f Krouse, Sarah (8 June 2018). "Verizon CEO to Retire, Succeeded by a Newcomer". The Wall Street Journal. Retrieved 29 June 2018. ^ a b c d e Charlton, Alistair (17 January 2014). "Microsoft CEO Race - Profile of Hans Vestberg". International Business Times. Retrieved 29 June 2018. ^ Erika Svantesson, Hasse Eriksson. "Hans Vestberg ny vd för Ericsson". DN.SE. Retrieved 2014-04-17. ^ "Fakta: Hans Vestberg". st.nu. 2009-06-26. Retrieved 2014-04-17. ^ a b Rao, Prashant S.; de la Merced, Michael J. (8 June 2018). "At Verizon, a Changing of the Guard as It Pursues 5G". The New York Times. Retrieved 29 June 2018. ^ a b c d "Change of guard at Ericsson". FierceWireless. 24 June 2009. Retrieved 29 June 2018. ^ "Ericsson ousts CEO Vestberg, shares soar". Reuters. 25 July 2016. Retrieved 9 June 2018. Ericsson's board were unanimous in its decision, which comes after months of criticism against Vestberg's leadership and pay. ^ Hodgson, Camilla (8 June 2018). "Former Ericsson boss Hans Vestberg is appointed Verizon chief". Financial Times. Retrieved 29 June 2018. ^ McLaughlin, Kim (25 July 2016). "Ericsson Ousts Vestberg as CEO After Turnaround Plans Stall". Bloomberg. Retrieved 29 June 2018. ^ Spangler, Todd (2017-03-31). "Verizon Hires Ex-Ericsson CEO Hans Vestberg, Eyes U.S. Internet Pay-TV Launch". Variety. Retrieved 2017-11-01. ^ Mukherjee, Supantha; Dang, Sheila (8 June 2018). "Verizon names tech chief CEO; prioritizes 5G network over content". Reuters. Retrieved 2 July 2018. ^ a b "Hans Vestberg elected chairman of Swedish Olympic Committee". European Handball Federation. 21 April 2016. Retrieved 29 June 2018. ^ "Stockholm: Staging 2026 Winter Olympics is 'desirable'". The Associated Press. 27 January 2017. Retrieved 29 June 2018. Wikimedia Commons has media related to Hans Vestberg. This page was last edited on 7 March 2019, at 22:12 (UTC).